Last week I blogged about my technical scheme to mark up sections (alternative lines) through rock gardens. I set up two sections at Lebanon Hills later in the week, another four on Sunday, and revamped one of them yesterday after some feedback from Leb Trail Steward John Lundell. So far, using white chalk to mark the rocks and flags to mark the entrance and exits has worked to set up the sections. It’s easy to move flags and the chalk marks can be removed by rubbing dirt on them. I’ve not yet gotten much feedback yet to know if it’s working for riders. And it’s not rained, so I’ve not had to re-chalk. The six videos all start with photos of the sections marked with red lines to make the alternative lines visible. 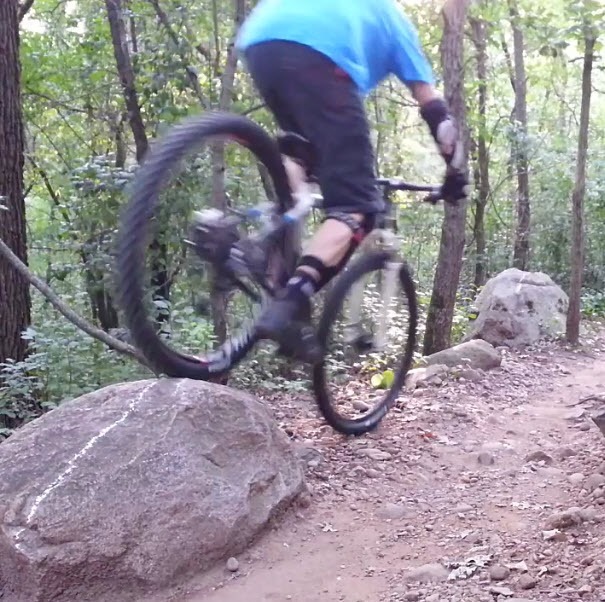 Then there’s a clip of me riding the section. I recorded the videos using my smartphone mounted on a small tripod, usually placed on the ground. Most of the sections required me to capture video from two or three different vantage points. The upshot of that? You see me cleaning everything but you don’t see a non-stop video of me cleaning entire sections from start to finish. Have I cleaned every section from start to finish? Not yet. The videos also don’t include any of my many failed attempts and crashes. All the videos are short, varying in length from 12-39 seconds. Attach a comment if you’ve got questions or feedback. 4. Wire flags have no place on a mtb trail. They are now getting moved around and coming loose as well as the dry weather turns the trail to dust. 5. Lines are forming outside the single track. If left unmarked its ok, but once marks are put down and more people ride it we have to start thinking of it as a part of the sustainable trail. See the rest of that comment and subsequent discussion for more.